This week has been a great week for coming (VERYx10) late to the party of two classics of Sci-Fi cinema; They Live and Star Trek II: The Wrath of Khan. Besides both films living up to their 'classic' status and more, they struck me simultaneously as films that execute on structural and production levels that a lot of films mining 80s for totems of nostalgia (like John Hammond looking for fossilised tree sap *points for a Jurassic Park reference pick up), just flat out miss. Here are some brief thoughts on why They Live builds an amazing world, and why the world of Wrath of Khan is more reminiscent of Master and Commander: The Far Side of the World than most space faring adventures. Writer/director John Carpenter is meticulous about building the tangible world of They Live before the wool is pulled from our eyes. As all good sci-fi should, Carpenter using 80s recession and social discontent relates to Reagan era "Vietnam Vengeance" rhetoric the tangible bedrock of the fantastical story that you're about to be told. 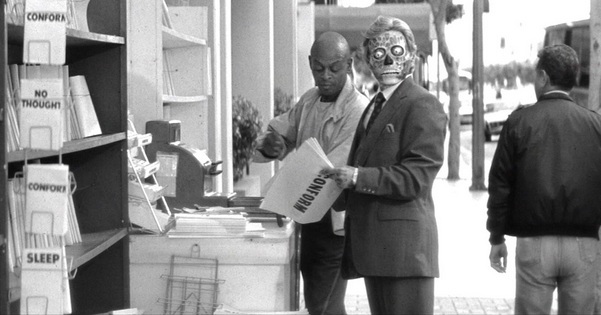 As Roddy Piper's Nada arrives in the sprawl of John Carpenter's alternate LA reality in They Live, he doesn't have to say a word. With a weathered pack, and sleeping bag underscored by the rolling hook of a synthetic, Western flavoured beat, you feel like you're entering the 'Wild West' in more modern and civilised clothing. Nada's burly physique and loss also echoes that of John Rambo in First Blood; the Vietnam War's problematic reintegration of veterans back into a society that rejected them. Carpenter shows Nada distracted by street preachers warning anyone in earshot of the veil over our existence. The police are quick to squash these gatherings; this agitation alongside economic downturn (rich getting richer and the lower classes financially arrested) feels all the more authentic and visionary when you consider the manifestations of discontent in the Occupy movement. Nada finds a job and befriends Frank (Keith David) and they find solidarity in the contrast to the 'yuppie' class. By the time you're exposed to reality beneath the shroud, you're seeing the world through the protagonist's eyes. This is Carpenter in his career 'purple patch' (during which he made films like Big Trouble in Little China, The Thing, The Fog, Halloween etc.) and each film showcased obvious storytelling intelligence and sense of pace that by the time the characters become consumed by their situation, you're completely invested. Nicholas Meyer's Wrath of Khan on the other hand does such an incredible job of feeling like a lived in world. It was striking, as a first time viewer, was the film's ability to be able to evoke the feeling of legacy. While Trekkies' may be 'face-palming' and pointing to the Original Series and Star Trek the Motion picture as obvious pre-work to this film, please allow me to clarify. It's fine to establish a universe, revisit it, and lose that intangible purchase of the real world. Contrast the mistakes of the Star Wars Prequel trilogy that J.J Abrams (a Star Trek alum) corrected in his approach to The Force Awakens. 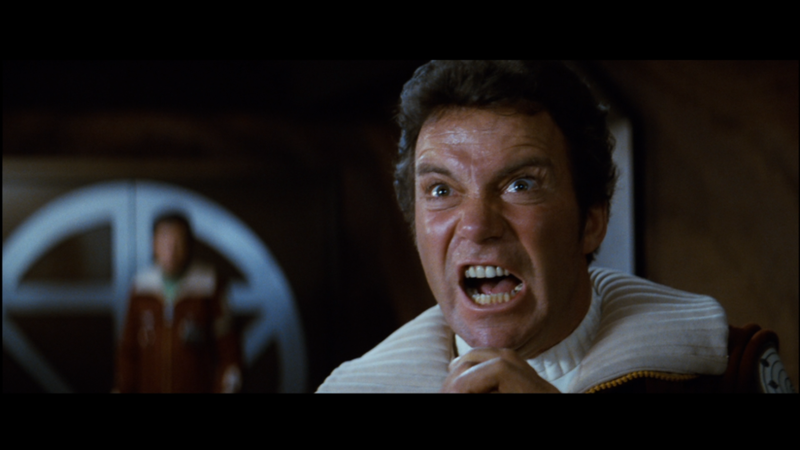 Wrath of Khan from a design standpoint is perfect. The invisible crew of the Enterprise; production designer Joseph R. Jennings, art director Michael Minor, set decorator Charles Graffeo and finally costume designer Robert Fletcher; are heroes in their own right. Despite the fantastical life creating device 'Genesis' and the spectacular nebula chase sequence at the film's climax; you find yourself remembering more vividly the buckles on Kirk's (William Shatner) sweater; the chairs in his apartment and the gloves that Spock (Leonard Nimoy) wears to wrangle the nuclear material. The crafting of those artefacts and the actors performing naturally in the space adds this unquantifiable but essential authenticity. What's probably more significant than the mood of the piece is that the sets are reflections of the characters inner workings. Kirk's living quarters looks like they've been plucked from the pages of Star Fleet Ikea. Apart from the intimate fireplace hearth, feels like it's a domesticated Admiral Kirk, when we know that his place in the Captain's chair. Khan's (Ricardo Montalbán) refuge on Ceti Alpha V is carved out of metal; surviving by bending the available material with brute force and will. Similarly, Spock's captaincy comes with clinical approach and therefore a meticulous deck. After the first wave of attacks from Khan's ship, the smoke-stained, short circuited flight deck of the Enterprise feels like home for the original Captain. Establishing the context of the world with the script and creating the world in the frame (or what film theorists call mise en scène) amplify cinematic stories. In B Grade Horror and 'swashbuckling' TV to movie adaptions of nearly thirty years ago they seemed to have had it nailed in a way that remains elusive to a lot of contemporary blockbusters.